The standard views bar has different design for the milling and turning coordinate systems. When one of the buttons is selected, the corresponding view vector is set in the graphic window. 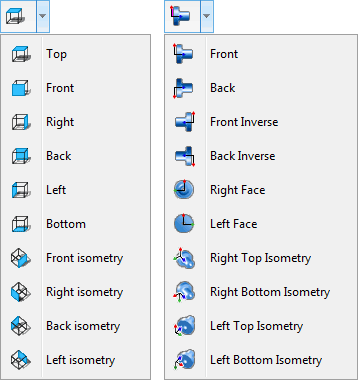 If the view vector in the graphic window is changed using another method, the sunken button on the panel releases automatically. Double clicking of middle mouse button (mouse wheel) sets one of the nearest standard views.